The 19th Knesset is celebrating its one-year anniversary: how does it look? 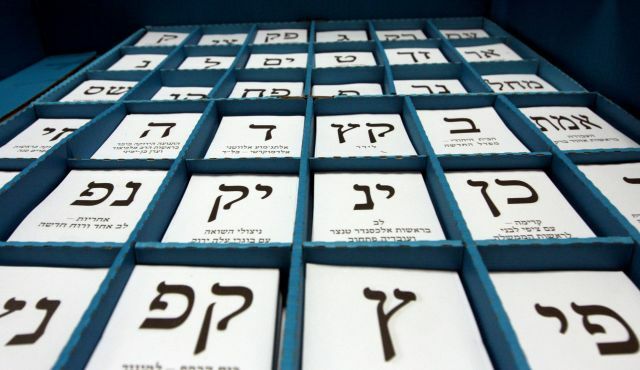 The last legislative elections in Israel were held one year ago today. If the 19th Knesset survives a full four-year term, it is now quarter-way through its life. It is far too early to begin predicting the results of the next election, but this is an opportune moment to examine the changing contours of the Israeli political map, and see to what extent the big stories of the last year have changed Israelis’ opinions about the leadership they want for their country. The 2013 elections produced a highly fragmented and deeply polarised parliament, in which the strongest list – the right-wing Likud-Beiteinu, headed by incumbent prime minister Benjamin Netanyahu – secured just over one quarter of the Knesset’s 120 seats. After intense coalition negotiations, Netanyahu announced a cross-spectrum coalition of 68 MKs, headed by the Likud-Beiteinu and including the Jewish Home, Yesh Atid and Hatnuah. Netanyahu was prevented from assembling a narrow right-religious coalition by an impromptu alliance between the nationalist-religious Jewish Home and secular-liberal Yesh Atid, which declared that either they would both serve in government or would sit in opposition together; and the unlikely bromance of Naftali Bennett and Yair Lapid forced the PM’s hand. Apart from the return of Avigdor Lieberman to the Foreign Ministry after his acquittal on corruption charges, the composition of the cabinet has not changed since the election, and the coalition has been very stable. The 19th Knesset officially contains 12 parties, filling 120 seats: the Likud-Beiteinu (31 seats), Yesh Atid (19), Labour (15), the Jewish Home (12), Shas (11), United Torah Judaism (7), Meretz (6), Hatnuah (6), Hadash (4), Ra’am-Ta’al-Mada (4), Balad (3) and Kadima (2). There are several important comments to make on this. The Arab parties are anti-system parties, disputing the legitimacy of the state. The ideological gulf between them and the rest of the centre-left is thus enormous, and they are never spoken of as coalition material: Ra’am-Ta’al-Mada has strong Islamist tendencies, Balad is an Arab nationalist party, and Hadash is the successor to the Communists. The ultra-Orthodox parties are socio-economically very left-wing, favouring heavily redistributive policies: Shas and the UTJ do not automatically align with the rest of the right and have previously formed governments with the left. The Knesset in fact contains 16 parties, not 12: this latter figure deceptively lumps together independent parties that ran on joint lists for electoral gain. Specifically, the Likud and Yisrael Beiteinu formed a joint ticket in 2012, mistakenly predicting that a right-wing super-bloc would attract greater support; United Torah Judaism is an alliance between the Haredi Agudat Yisrael and Degel HaTorah; and Ra’am-Taal-Mada is a merger of three small Arab parties. The Jewish Home is a unitary party, but is itself a merger between the old National Religious Party (Mafdal) and its rebellious satellite factions. The Knesset contains 7.28 “effective” parties, or 9.57 if the joint lists are disaggregated into their component parties. The effective number of legislative parties (ENOP) is a political science measure that counts total parties by weighting their relative strength, such that the presence of mini-parties does not skew our impression of political fragmentation: the British Parliament, for example, had an ENOP of 2.57 as of the 2010 elections, containing two major parties, one medium-size party and then 10 micro-parties that hold scarcely 5% of seats between them. Israel’s ENOP of 7.28 is lower than in 1999 and 2006, but higher than in 2009. This figure puts Israel’s legislative fragmentation in excess of Iraq’s (4.35), on a par with Morocco (6.70) and Bosnia and Herzegovina (7.67), and surpassed only by Belgium (8.42) and Brazil (10.36). Fragmentation in the electorate is even higher than the composition of the Knesset suggests. Israel’s system of single-district proportional representation uses a 2% threshold, which produces a faithful translation of votes to seats – but still means that 7% of votes were wasted in 2013, which in fact produced 8.68 effective electoral parties: votes wasted on Strong Israel, Am Shalem and other protest parties amounted to support for 1.6 effective parties. Note, however, that majoritarian electoral systems in other countries artificially conceal the degree of political fragmentation by hindering the translation of substantial electoral support into parliamentary representation, such that the legislative ENOP in many electorates may give a misleading impression of consensus. The 19th Knesset is one of the most fragmented legislatures in the world, ever. Tel Aviv and Jerusalem are polar opposites, and internally polarised too. The centre-left won 61.2% of the ballot in trendy, modern Tel Aviv, but scarcely 21.3% in more conservative Jerusalem; and whereas Jerusalem gave 27.6% of the vote to the ultra-Orthodox parties, they picked up only 6.8% in Tel Aviv. The right-wing vote in Tel Aviv grew the further south (and poorer) the neighbourhoods, but in Jerusalem, voter preferences swung almost schizophrenically from street to street. Haifa was something of a bellwether city: proportional support for most parties was only slightly in excess of their national vote-share, matched by the underrepresentation of the Jewish Home and ultra-Orthodox parties. Most rural communities abutting Gaza were resolutely loyal to Labour and the left-wing Meretz constant rocket fire not having induced a swing to the hawkish right; a similar pattern exists along the Lebanese border. Arab areas are clearly identified by their unique voting patterns, but preferences were variegated. Whereas parts of the Negev voted virtually universally for Balad and Ra’am-Ta’al-Mada (picking up 96.4% in Arara Banegev), Shas and Labour picked up more than the odd vote; the Jewish Home even won 1% of the vote in Bedouin Rahat. Support for Hadash was strongest in the Arab areas along the Green Line and in the Galilee. West Bank settlers overwhelmingly backed the Jewish Home, with Likud-Beiteinu in second place. Ultra-Orthodox settlements, unsurprisingly, voted almost exclusively for the ultra-Orthodox Shas and the UTJ. The ultra-nationalist Strong Israel, which splintered off the National Union when the party merged into the Jewish Home, registered an impressive 28% in Kiryat Arba (Hebron), but still failed to cross the national 2% threshold: an indication of the political gulf between it and mainstream Israel. In parts of the Jordan Valley, however, the centre-left claimed well over half the vote; and Har Adar, straddling the Green Line, backed the centre-left even more strongly than did Tel Aviv. 1. LIKUD-BEITEINU is the undisputed leader of the pack, averaging on 30 seats, as Israelis see no rival to Benjamin Netanyahu as prime minister. The acquittal of Foreign Minister Avigdor Lieberman over corruption charges has had no noticeable effect on the list’s support. 2. YESH ATID briefly tussled with Likud Beiteinu for first place, zig-zagging around 25-30 seats, until May, when it took a nosedive: public disappointment with Yair Lapid as Finance Minister contributed much to the declining fortunes of the party, averaging 13 seats since August. 3. 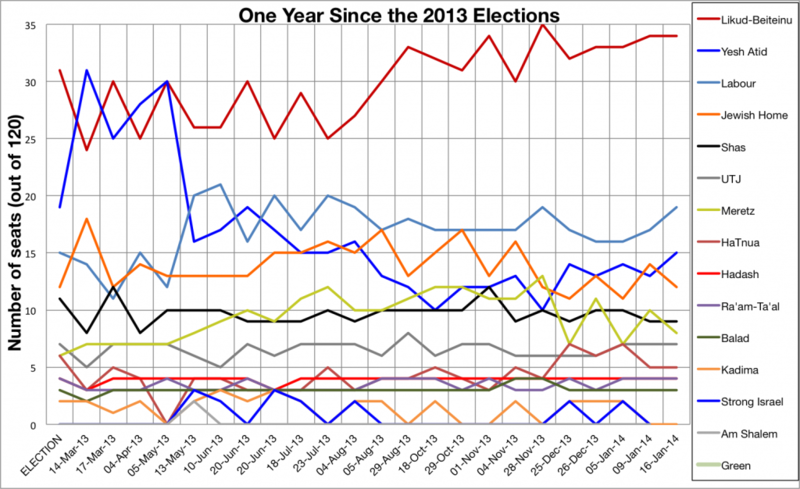 LABOUR rose to become the second-most popular party in May, a lead it has maintained. It is likely that many centrist votes captured by Yesh Atid in 2013 are returning to the traditional home of the left, which last headed a government in 2001. The election of Isaac Herzog as Labour chairman does not seem to have had any effect. 4. The JEWISH HOME, the ultra-nationalist party that quadrupled in size in the last election thanks to a charismatic new chairman and makeover, has been entangled with Yesh Atid for third since the summer, as the public has grown used to this new force on the right. 5. MERETZ, a liberal and social-democratic party, has seen its support increase, but not steadily so. Interestingly, the trend line is almost parallel with Labour’s, suggesting that the parties are not competing for votes as much equally siphoning votes from Yesh Atid. 6. HATNUAH – the party created to facilitate the political comeback of former Foreign Minister Tzipi Livni, after she failed to be re-elected Kadima leader and temporarily resigned from politics – has been fluctuating between 3 and 7 seats: it focused its campaign almost exclusively on the single policy of jump-starting the peace process, so support is stable in the absence of any news on that front. 6. Support for HADASH, BALAD and RA’AM-TA’AL-MADA has remained stagnant: no party has deviated more than one seat from its present share. A new Christian Arab has been formed to encourage integration into Israeli society, but it has not (yet) caused a splash. 7. KADIMA – which headed the coalition after the 2006 elections and remained the largest party in the Knesset after the 2009 elections – is now politically irrelevant. Since imploding from 28 seats to 2, it has dipped below the threshold about as often as the ultra-nationalist Strong Israel, which failed to enter the Knesset, surpassed it. Observers should be cautious, however, about making too many inferences from the polling data. Firstly, Israel relies on suboptimal polling methodology: samples are too small (often only 500 people) to filter out the effect of outlier results, and there are too few polls to accurately measure opinion at any given moment. It is impossible, therefore, to say whether changing numbers reflect a shift in public opinion or evidence of random bias in one poll, perhaps resulting from the accidental overrepresentation of one party’s supporters in a polling sample. In a poll of 500, for example, the addition or subtraction of a single voter would be enough to tip Kadima in or out of the Knesset. So any analyst who comments “Meretz is up by one this week” simply doesn’t understand statistics. Moreover, samples are often unrepresentative of the population, introducing systemic biases by overweighting the preferences of certain demographics: Yair Lapid had always predicted that he would win more seats than he was forecast, because pollsters relied on calling people by landline, and his supporters, predominantly young, had only mobile phones. Secondly, the volatility of the Israeli political system makes it difficult to predict what will happen beyond tomorrow. Electoral volatility in 2013 was 34.2%, meaning more than a third (net) of Israelis had changed their minds from 2009, and a third was still undecided two weeks before the election. Everything could be thrown off balance by the split, merger or creation of parties: pollsters are already testing the waters for a possible new party led by former minister Moshe Kahlon, who is considering a comeback and would likely steal leftist voters from the left for the right. Improvements or setbacks in the economy or peace process could be game-changers. Preferences expressed today are far from settled, and will surely shift with the news cycle and other key political or economic indicators. The news, therefore, is that there is no news. Everyone can go back to work. For more analysis from me on the Israeli electoral system, check out ‘The Dangers of Cosmetic Electoral Surgery‘. Please feel free to contact me at ea392@cam.ac.uk if you would like access to my database with the psephological data for this report. To follow polls as they come out, I recommend keeping an eye on KnessetJeremy.com.